She's seventeen. She's been abused. She has a child. And she's HIV-positive. Ana's journey is a long one. Shuffled from home to home, she rarely finds safety or love. And then she meets a boy. Berto is one of the only people Ana trusts with all her secrets. That trust puts Ana on a path to breaking the silence that has harmed her and leads her to new beginnings, new sorrows, and new hope. 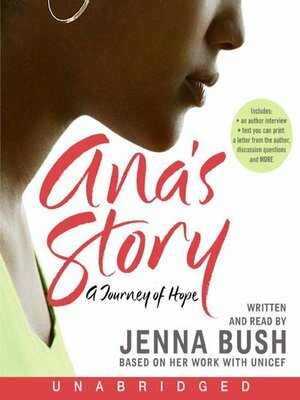 Jenna Bush has written a powerful narrative nonfiction account of a girl who struggles to break free from a vicious cycle of abuse, poverty, and illness. Based on Jenna's work with UNICEF and inspired by the framework of one girl's life, it is also the story of many children around the world who are marginalized and excluded from basic care, support, and education. Resources included on this audiobook share how you can make a difference to children in need and how you can protect yourself and others. A portion of proceeds to benefit the U.S Fund for UNICEF.